Starting in 2016, we began using a new RFID timing system we developed and named ChipCard RFID timing. In addition to the J-Chip active timing system we have been using since 2012, our new ChipCard timing system provides a unique set of capabilities. At the heart of this timing system is a durable new plastic ChipCard that is capable of being read 100,000 times and is rated with 50-year reliability. Each ChipCard is assigned a number that can be matched to the the racers bib number, ensuring that every racer can be accurately identified. The ChipCard is attached to the seatpost with a pair of hook and loop straps. 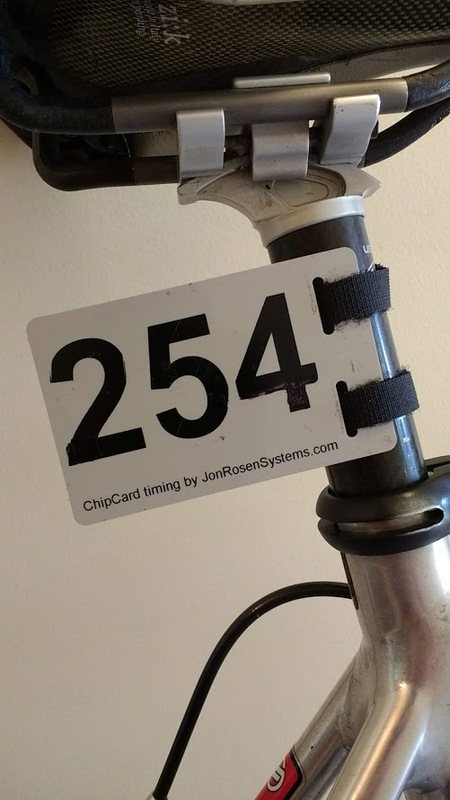 Attaching the ChipCard to the seatpost provides a consistent location on the bike that is 48″ from the front edge of the tire. The ChipCard is read using an antenna mounted at the side of the road, allowing us to provide timing for any size finish. The antenna is also offset 48″ from the finish line so that the chip time is calculated when the front edge of the tire is on the finish line. With two high gain antennas on one side of the road, no mat, cable or truss is needed on the road. ChipCards are given to racers at no charge as part of our timing service. Lost or missing chip cards can quickly and easily be replaced on race day, and cards can be tested anytime before a race starts. The ChipCards are read using an Impinj RFID reader that can process up to 600 chips per second, allowing each chip to be read up to 20 times as it passes by the antenna. Using quadratic regression analysis, the chip timing software calculates the chip time with 1/100 second precision.